MK Rabbi Eli Ben Dahan, was attacked as he attended the funeral of Rabbi Ovadia Yosef Monday, says incitement in haredi media to blame. 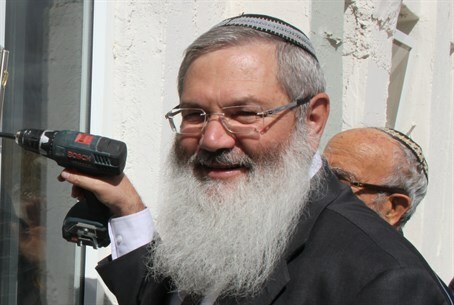 Deputy Minister for Religious Affairs, MK Rabbi Eli Ben-Dahan (Bayit Yehudi) was physically attacked as he attended the funeral of Rabbi Ovadia Yosef zts"l on Monday night. Speaking to residents of a retirement home, in the Beit Hakerem neighborhood of Jerusalem, he also shared his views on the incitement in hareidi media that he said had fueled the incident, and described his last meeting with Rabbi Yosef. Rabbi Ben-Dahan paid tribute to Rabbi Ovadia Yosef, who passed away at the age of 93 on Monday, telling residents of Ahuzat Beit Hakerem retirement home: "We are talking about a professor of the Jewish World of such a magnitude, that I don't know if this of future generations will see the likes of again." He went on to say that he had spent three hours at Rabbi Yosef's funeral Monday night when he was hit and kicked by a group of angry hareidi youths. "I went to show honor for the deceased, and there were a few youths who attacked me physically, and kicked me," Ben-Dahan said. "I'm happy to say, a large crowd protected me, and prevented them from getting close to me," he added. Ben-Dahan pointed to recent incitement in the hareidi media for fueling the animosity shown towards him, and also laid the blame at the hareidi politicians who, he said, "are finding it hard to absorb the fact that they are not in the government." "This incitement has to stop," the Deputy Minister said. For an hour and a half, Ben-Dahan said, his personal security guards had searched for him - following a break down in communications - that led to him being separated from them. Later, speaking to Arutz Sheva about the last meeting he had with Rabbi Ovadia Yosef, Rabbi Ben-Dahan addressed the controversial comment Rabbi Yosef had made before the recent national elections, describing the Jewish Home party as a "House of gentiles." "There's no doubt that this was something that was wrong to say," Ben-Dahan said, adding that a month and a half ago Rabbi Yosef had invited him to a meeting and told him, "I love you and want to bring you close." "I am certain that he regretted the statement he made, that the Jewish Home party was a home for gentiles (goyim)," the Deputy Minster said,"from my point of view this statement was his last will."